And what book, you may well ask: Infinite Jest, the 1996 novel by David Foster Wallace. It is a 1,079 page novel that is said to be the "defining work of the 1990s" by people who say such things. And why am I going to read this book? Because I just watch the movie, The End of the Tour last night. It is based on writer David Lipsky's memoir, Although of Course You End Up Becoming Yourself which is basically the story of Lipsky's experience going on a book tour with Wallace in 1996 to write a story for Rolling Stone. It's a great film, BTW. 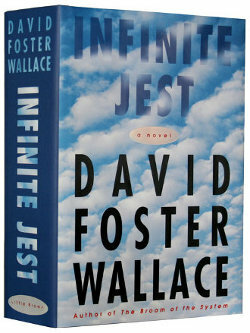 I was intrigued enough by the film to want to read Infinite Jest. I was also intrigued by the fact that Wallace hung himself in 2008. For some reason I'm a sucker for successful author's who kill themselves. It's one of the things that made me read The Confederacy of Dunces by John Kennedy Toole. The irony about him was that Toole killed himself eleven years before his book was published and it ended up winning the Pulitzer. Call me crazy, but if I ever actually wrote a book let alone get it published, I'd feel pretty good about it. I don't think I'd be thinking about suicide. But then again, I tend to think most fiction writers are all shy a few pieces of their chess sets anyway (if you catch my drift) and write as a way of getting free group therapy. At least that's why I blog. So I am looking forward to diving into a 1,079-page book (include some pretty extensive end notes). I ordered the actual printed book largely because it was cheaper than the Kindle version and because I thought it would look impressive to people on the train. I do worry that I may strain something carrying it around. Never mind that my attention span has been worn away by Twitter's 140-character limit. I may only read 140 characters at a time and take major breaks to play Candy Crush. I imagine I'll finish the book sometime around 2025 at which time I'll write a review here. Oh, you say that now, but can you really endure nine more years of my repetitive digressions just to read my take on Infinite Jest?